Of all the desserts I make, this is the simplest one to put together and one of the most popular ones too, especially if you are gluten free. Actually, this is more than a dessert, it’s an energy ball. You know those energy bars that your trainer tries to sell you or your local natural food store carries, stating how healthy it is and natural they are. 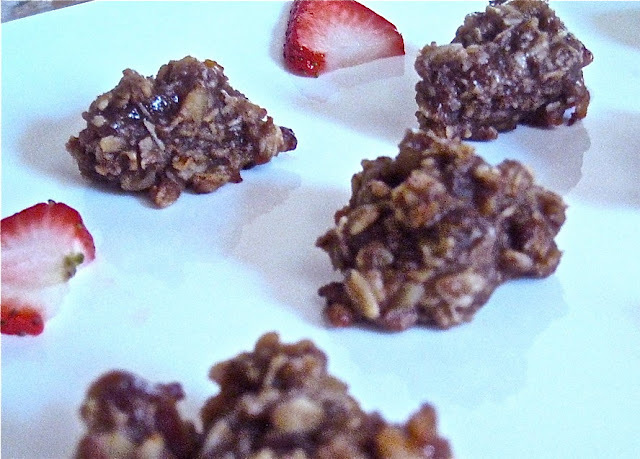 Well, these Cocoa Chia Date Balls beat those energy bars, hands down! The key ingredient here is medjool dates. That’s right…. that dried fruit that grows indigenously across the Middle East and North Africa and is one of the seven blessed species that God blessed. There must be a reason, from all the fruits we have in this world, God decided that this is the one He’s blessing. For good reason, Medjool dates only contain about 66 calories each – so that’s ideal if you are concerned about your shvelt body. They are a good source of fiber and contain high levels of the essential minerals potassium, magnesium, copper, and manganese. In other words, it’s good for you. Dates were commonly eaten by nomadic travelers as they provide a lot of energy and healthful nutrients with the added benefit of being readily available. So if a nomad can survive on dates in an arid desert, you certainly can thrive on these as well. Although, right now in NY, it feels as hot as a blow dryer blowing on me. Now about the taste of these delightful energy balls. They are raw!! That means, no baking. Just throw into a food processor and presto. The combination of cocoa and dates suggests a taste of a rum liqueur. Many people have asked me if I use rum, and somehow the cocoa just extracts the taste of rum when combined with dates. Each bite is like a cookie that is moist and a bit nutty. I added chia seeds, because it expands in your belly and makes you feel full. Plus there is a lot of talk about chia as a protein source. Important for us vegetarians. I originally made a version of these for my Silk Road Vegetarian cookbook called Orange Blossom Date Balls. For that recipe, you will need to purchase my book. As you can imagine by the name, it’s a fragrant date ball, more reminiscent of the Silk Road. Combine chia seeds and water in a bowl and mix together. Let seeds absorb water. Once absorbed, place in the food processor with the dates and coconut oil, and process until smooth and well combined. Add the sea salt and cacao powder, and process until smooth and well combined. Add the walnuts and process until evenly distributed, then remove from the processor and stir in the coconut (the mixture will be very thick, and you may need to use your hands). Form the mixture into 16 balls, and enjoy! Store extra in the fridge. The true origin of Bananas is found in the region of Malaysia. By way of curious travelers, it ended up in India. Alexander the Great relished his first taste of the banana, and is credited with bringing the banana from India to the Western world. In the late part of the 1800’s is when Americans tasted the first bananas to arrive in their country. Ever since then, bananas have been used as a sweetener in many desserts. These moist banana morsels are an ode to the past, and yet modernized with rolled oats which adds just the right amount of crunch and fiber. Oats contain a healthy dose of soluble and insoluble fiber. The fiber in oats is slow to be digested, making you fuller longer. The fiber in oats is also beneficial to the digestive tract in keeping the bowels functioning regularly. Mashed ripe bananas and dates adds sweetness and flavor – a delicious way to use up your overripe bananas, and add even more of a nutritional value to these cookies.Forget about buying all those power bars with complicated ingredients, instead bake these amazingly simple, gluten free and vegan nuggets and enjoy it on the go. In a large bowl, mash the bananas. Stir in the oats, dates, oil, walnuts, cinnamon, nutmeg, vanilla, and ground cardamom. Mix well and allow to sit for 15 minutes. Grease a cookie sheet and then drop teaspoonfuls onto prepared cookie sheet.